Americans spend about 90 percent — or more — of their time indoors.1 During the winter, cold temperatures force many to also keep their windows tightly closed both at home and on the job, which means you’re living and breathing in a tightly sealed environment until spring. Given that the majority of the air you breathe is coming from your indoor environment, it’s important to take your indoor air quality into account when looking out for your, and your family’s, health. Why is Indoor Air so Toxic? Most homes are now designed to be energy efficient, and this means they’re well insulated and have very few air exchanges between indoor and outdoor air. If your home is not well ventilated and contains the numerous sources of indoor air pollution common to most indoor environments, there’s a good chance you’re breathing dirty air in your home. “If too little outdoor air enters a home, pollutants can accumulate to levels that can pose health and comfort problems. Unless they are built with special mechanical means of ventilation, homes that are designed and constructed to minimize the amount of outdoor air that can “leak” into and out of the home may have higher pollutant levels than other homes. Anytime you spray a pesticide, cleaning product or air freshener in your home, or use paint or other industrial products, you’re releasing a slew of chemicals. Those chemicals, many which have been linked to health problems, accumulate first in your air and then settle down into your household dust. Anytime you walk through a room, that dust gets stirred up into the air once again, where you breathe it in. What Types of Toxins are in Your Home’s Air? : These are emitted from paint, paint strippers, cleaning supplies, furniture and building supplies, pesticides, office equipment, permanent markers and more. Fumes can be released from these products not only when they’re in use but also while they’re stored. Some VOCs are linked to cancer and damage to the liver, kidneys and central nervous system. Studies suggest concentrations of VOCs in air can be up to 10 times higher indoors than outdoors. : Indoor particle pollutants come from fireplaces, wood stoves, furnaces and kerosene heaters. They can cause respiratory infections, bronchitis and lung cancer. pesticides have been linked to increased risks of cancer and damage to the liver, kidneys, endocrine and nervous systems. : Mold, mildew, bacteria, viruses, animal dander, dust, saliva, pollen, and mites are all examples of biological pollutants in your home. Droppings and body parts from cockroaches, rodents and other insects can also add to this toxic load. Some biological pollutants can cause allergic reactions and asthma in sensitive individuals, while others, like mold and mildew, can release toxins into the air. Common health complaints related to biological pollutants include allergic symptoms (sneezing, watery eyes, coughing, shortness of breath), lethargy, dizziness, fever and digestive problems. : Radon is an invisible, odorless gas that comes from naturally occurring uranium in soil and water. It can seep into your home through pipes, cracks in your foundation, sumps and drains and other openings. Radon is carcinogenic and can cause lung cancer; it is the leading cause of lung cancer among non-smokers. Indoor air pollutants can lead to numerous short- and long-term health problems. More immediate effects occur in people who are sensitive or allergic, or because pollutant levels are very high. Such symptoms may include eye, nose and throat irritation, fatigue, headaches, and dizziness, or they may mimic symptoms of a cold or other viral illness. Because these illnesses can occur after long-term exposures, but often do not show any symptoms until you’re diagnosed, it’s important to take steps to improve your indoor air quality … even if you’re not currently experiencing any noticeable related health effects. Winter is an ideal time to take stock of your indoor air, as it may be many months before you crack a window to let some fresh air in. What can you do to keep your home’s air as pure as possible? : Avoid spraying pesticides, chemical cleaners, air fresheners and other synthetic products in your home. Also minimize your use of paint thinner and other solvents, and look for non-toxic, low-VOC or zero-VOC paints. If you will be purchasing new furniture, carpeting, cabinetry or flooring, look for those made of green building materials, as these will not outgas VOCs the way conventional building supplies will. : Most heating and cooling systems do not circulate fresh air into your home, so in order to help keep your home well-ventilated you should consider using window or attic fans, kitchen and bathroom exhaust fans, or a window air conditioner with the vent control open. 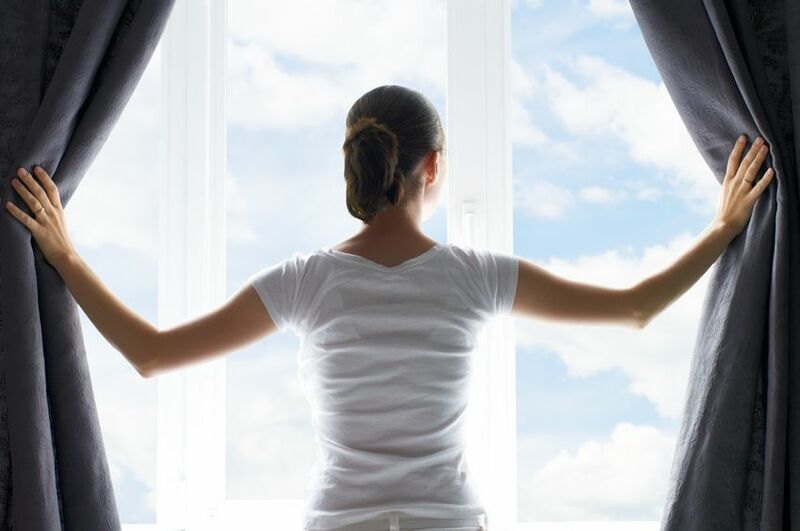 Opening windows as weather permits is also important, especially when you’re using products that generate high levels of pollutants (such as paint or paint thinner). Some newer homes may also have the option of air-to-air heat exchangers, which bring outdoor air into the home while still being energy efficient. : Testing radon levels in your home is the only way to detect it. Contact a qualified radon service professional in your area to find out about testing and, if levels are elevated, steps for removal. : Keeping the humidity level in your home between 30-60 percent will help keep dust mites, mold and mildew under control. You should also take care to keep areas where moisture collects, like basements and bathrooms, well ventilated, dry and clean. Be especially diligent with cleaning humidifiers regularly and using fresh water daily, as these are common breeding grounds for mold and other biological contaminants. : Regularly dusting and vacuuming your home will help keep dust mites, pollen, dander, and certain other biological air pollutants to a minimum. “The effectiveness of an air cleaner depends on how well it collects pollutants from indoor air (expressed as a percentage efficiency rate) and how much air it draws through the cleaning or filtering element (expressed in cubic feet per minute). Forced-air heating systems are notorious for leading to dry winter air in homes. This dry air can not only irritate your nose and throat, it can lead to dry itchy skin, nosebleeds and chapped lips too. Further, flu viruses are known to flourish in cold, dry air with very little moisture, making the flu easier to spread and even increasing the length of time it remains contagious once airborne.10 This means it’s possible dry winter air may increase your family’s risk of catching the flu. So if you’re trying to control moisture and humidity in your home to keep mold and mildew to a minimum, remember that a healthy balance — keeping humidity levels at 30-60 percent — is best. If your air feels excessively dry you can also use a humidifier — just be certain you keep it very well cleaned. Since Americans spend so much time indoors … and with winter upon us you and your family may be cooped up inside even more than usual … now is the ideal time to be extra vigilant about your indoor air quality. By taking the steps listed above you can help remove toxins and increase ventilation so your home’s air stays as pure and fresh as possible. 10 Proceedings of the National Academy of Sciences 2009 Mar 3;106(9):3243-8.